I have wanted to learn how to dive ever since I saw the movie “The Big Blue”. I began by thinking about snorkeling to start with. My first attempt to snorkel took place in Dhermi in the Ionian sea with water so clear that without descending deeper than my snorkel allowed me to, I could see the mysterious underwater world: rock formations and shoals of various kinds of small fish. I turned into a competent snorkeler after just one try and was so swept up in the excitement of the colours, shapes, and countless forms of underwater life that I decided to come back to this idyllic beach surrounded by mountains to master my swimming and snorkeling skills and maybe one day to try scuba diving as this is a great place for diving too – I had already seen there a group of professional scuba divers . 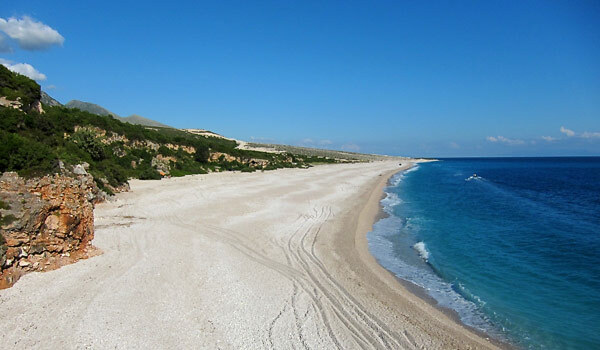 Dhermi is a small village which is located about 45km from Vlore going in direction of Sarande. The village is located near Llogara Pass at the foot of Acroceraunian mountains, which are overlooking a long beach and a stunning Ionian sea. Surrounded by green olive trees and citrus plantations, the village retains an impressive beauty. The sea around Dhermi is famous for its blue colour and clarity. Deserted rocky coves, orange and olive groves, and not (too many) foreign tourist in sight (just a few loveable local donkeys)… welcome to the Albanian Riviera. You can spend many days here exploring local mountains, caves and beaches. Other possible activities include diving off the rocks, sea kayaking, snorkelling or diving in the crystal blue waters of Ionian sea, having shots of rakia in between, and, if this is rather not your cup of tea – just click the “skip to next” button…and follow the mainstream tourism. The name of Dhermi is thought to come from the Greek term of “Drimadhes” which means “oak tree”. The history of the village is long forgotten in the history. 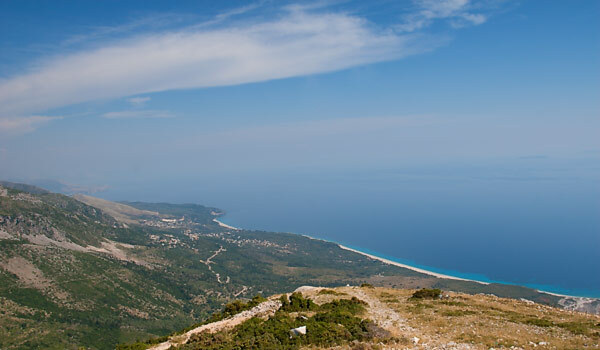 The region of Himara which Dhermi belongs to, has been inhabited by a tribe of Chaonians. King Philip of Macedonia (father of Alexander the Great) harassed this land during his reign. Since 167 B.C., the small port in Himara was a Roman naval base. 200 years later during Roman Civil war, the great Julius Caesar has landed his troops in the beach of Palase near Dhermi in his battle against Pompey, who occupied Orikum at the time. For many years the Himara region was under the Bulgarian rule (until 904 AD). Around 1370 AD a relative of Gjin Bua Shpata (Lord of Arta) came and has established his rule in Dhermi. After the assassination of Balsha II (very famous Medieval Albanian landlord) in 1385, his wife being a true amazon governed this land until 1392. These were the times of wars with Saracens, of which the evidence still can be seen in a few places, eg. the Pirate’s Cave and Alevra. The village is a showcase of beauty with its characteristic southern European architecture combined with customary Mediterranean vegetation. There are about 35 churches in Dhermi, which is one in about 20 families. In addition, there are three major monasteries: St Theodor’s Monastery whose well preserved ruins are located on the hill outside of the village, Monastery of the Virgin Mary located at the top of the hill of Drimadhes, and the Monastery of Stavridhi. The churches and monasteries in the village are a good example of interesting religious building, well worth visiting. One of the most prised tourist attraction around Dhermi, which brings back the Medieval history of Albania, is the Pirate’s cave. It’s an interesting, naturally created cave which was made famous by a writer Petro Marko and the movie with the same title. The landscape around the cave is very unique: between perpendicular rocks submerged in a very deep waters. The cave and can be reached by a boat or from the land. Another interesting place to visit is Alevra which is an unusual place with deep blue waters and the rocks going almost vertically into the sea. Located in a an attractive harbour with a rocky beach, above which, on the hill, stands the monastery of St Theodor’s. Gramata bay located about 30 minutes by a motor boat to the north of Dhermi is a must see for the culturally minded tourists, as it represents a real outdoor museum in a very unusual and beautiful location. The bay, located on the west side of the Karaburun peninsula has been used as a safe harbour for the ships since ancient times. On its stone walls there are writings dated back before the 4th century BC which express gratitude to the God Poseidon. Some other writings date back to the 1st century AD and have names of Mark Antony and Pompey. There are also drawings of ships, anchors and armor. The Gjipe beach located south of the Pirate’s cave is famous from its clean fine sand. Notoriously visited by tourists searching for some privacy, these days it is frequented by many vacationers. 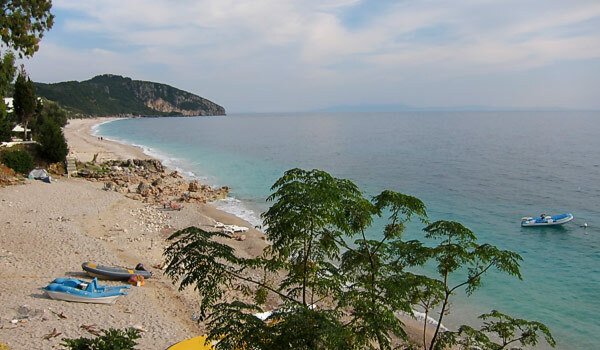 The beach still represents one of the most virgin beaches of Albanian Riviera. It can be reached by the sea as well by the land. Just shy of where the road finally stops to descend when travelling from Llogara Pass to Dhermi, there is a dirt road turn-off towards the sea (since 2014 this road has been asphalt-upgraded). Follow the road straight down to the 1km long beach, which despite of being slowly taken over by commercial tourism in recent years, it still offers plenty of undeveloped empty space. It is thought the beach was the landing area for Ceasar and his troops during the Roman Civil War in the 1st century BC. Ceasar and his legions moved across the Llogara Pass to the north and fought Pompey’s troops which were stationing at the time near Oricum (today archeological park of Orikum). To this day there are visible remains of 2nd century BC settlement of Palaeste which can be found near Palase. The geographical location of Dhermi and the archaeology of the area make this the ideal combination for an afternoon of rest and relaxation. I’ve travelled in Dhermi for about 5 times and I consider it as one of the most beautiful turist attraction . For those that haven’t still visited it I recommandate it too you because it certinly won’t let you bored.